It seems more and more web sites are offering users to subscribe to updates delivered by email. 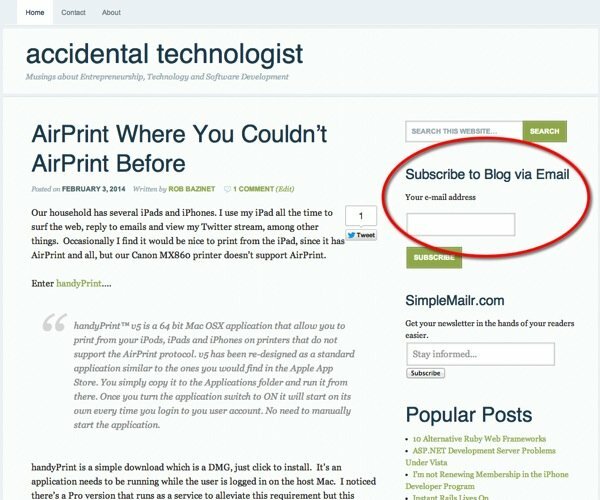 ?If you would rather have posts delivered right to your inbox instead of visiting the site or relying on RSS, you can now subscribe and forget. Just add your email to the ?Subscribe to Blog via Email?, submit and confirm your desire to subscribe in the confirmation email and thats it. ?You can unsubscribe any time. July 1 is fast approaching and Google Reader is shutting down. ?Many people in the world use this service to read and sync their RSS feeds. ?When I heard it was shutting down I was a bit annoyed but not surprised, but today I am anxious for it to shut down so people will stop talking about it. ?Google Reader, it’s been nice but not real nice. ?Goodbye! I have found a paid service I am happy to pay for and support, Feed Wrangler by David Smith. ?Feed Wrangler costs $19 per year and it developed by someone I believe will do his best to be around tomorrow. ? I have officially dumped Google Reader about a month ago and been using Feed Wrangler ever since, and I could not be more happy. Out of the gate Feed Wrangler has a web site that can be used to read posts, mark them read/unread and add to Instapaper. ?It works very similar to Google Reader but with *much* cleaner interface. ?I never used Google Reader this way, I always used some third-party apps in my Mac, iPhone or iPad. I have used a handful of client applications for Google Reader over the years and settled on a couple that worked really well on my Mac and iPad. ?When I heard about Google Reader shutting down my first concern was what I would use for applications. Feed Wrangler has free applications for the iPhone and the iPad that work really well. ?I found a few little UI bugs or inconsistencies that I needed to get used to, but nothing I was unable to live with. Thanks to the great API, third-party apps are starting to pop-up with Feed Wrangler support. ?Mr. Reeder for the iPad, and most important to me is ReadKit for the Mac. ?Both of these applications are fantastic and I am using them now. The main part of what I consider the syncing platform is the backend web site and API which helps keeps the applications knowing what’s read and what has yet to be read. ?This is transparent and should be, I don’t need to know the details nor do I care. ?I just want to be able to go from device to device and not have to miss an article or mark something read more than once. So far, it just works. One beautiful part of this platform is the open API for developers so they can create any number of client applications. ?Did I mention this is a supported and nicely documented API? ?Unlike what Google Reader had offered, this will be a pleasure to write application for. As someone who consumes API’s for a living, the style of the documentation and examples is a lesson other developers should follow. You have more choice popping up now that Google Reader is shutting down but David Smith has done some really nice work so far and I can only suspect he will new features all the time. I am very happy and think Feed Wrangler is worth checking out.